I love Frosting! Yes that is a confession. I’m guilty of putting too much on what I bake or saving some in the fridge. Gasp! I can’t believe I just said that for the world to see. Haha! The flavor I love best is Maraschino Cherry. I think it’s because when I was little my Mom would make us an extra special treat every holiday. She would put Maraschino Cherries and some of the juice in 7 up and call it a Shirley Temple. We all loved it. We even got to use the fanciest wine glasses ever! I felt so special. We all did. Scrape the sides to get all the sugar mixed in. In addition to the cherry juice add the last cup of sugar. Now when I can find ways to merge Maraschino Cherries in my cooking I do. You cannot go wrong with the flavor. Especially in Frosting! So Yummy! I use it on Sugar Cookies, Cakes, Cupcakes and even Cherry Rolls. You can head over to Another Cent Saved to get the Cherry Roll Recipe .I’ve even used frosting on the top of Pancakes since I am not a big syrup fan. For me it makes anything extra special. Did you know you can make your own Maraschino Cherries? You can by using Maraschino Liqueur. There is a great recipe from Ted Allen Here! That is next on my list to do. Homemade is always better! I love love love new frosting recipes and I like to keep some in my fridge for the occasional treat! I am going to make this one asap! Tara recently posted…Featured Wedding: Wasson Stardance Wedding!!! Thank you Tara. I am totally sure your going to love it as much as I do. That sounds like heaven to me. I have never had cherry flavored frosting, but I bet it’s ah-mazing on a chocolate cupcake! Yum! Best. Frosting. Ever! I’ve never seen this before, but I absolutely love maraschino cherries. Thanks! I love the sweet taste of these cherries! I am sure this tastes amazing! I will have to try this myself. It’s amazingly good Susan. I highly recommend it. Oh yum! I can’t wait to give this a try! I’ve got an ooey gooey chocolate cake recipe that I think this would be perfect for. 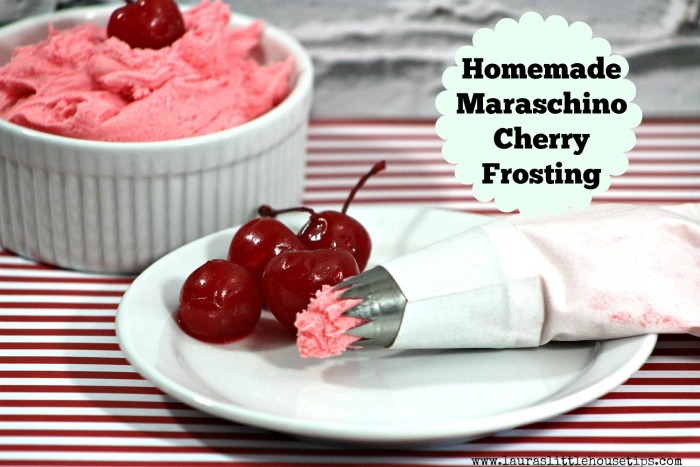 I would have never thought of making a frosting out of maraschino cherries! What a great idea…it sounds delicious! I’m such a maraschino cherry lover! I’ve been known to drink the juice from the jar once the cherries were gone. 🙂 I’ve actually been eating fresh cherries all week long. You know, I’ve never made cherry frosting, but I will now after gazing longingly at your frosting. Yum, this sounds so good! I love maraschino cherries so much! Yum this looks so good. I love frosting, but I don’t think I’ve ever had cherry frosting! I bet this would be amazing in cake. Mmm I will have to try this! I am weird and don’t like cherries, but my kids love them! Well, okay that’s sort of not true…I like cherries like off of a tree lol…just not cherry flavored stuff. But I love how easy this looks. I’m sure my kids would love something frosted with that! I love maraschino cherries despite the rest of my family not being very big fans. I would love to indulge in this frosting on top of chocolate cupcakes! I’ve never made my own frosting before! This sounds super tasty! Cherry and chocolate is a fabulous combination!! And now I am craving a cupcake!! This looks delicious! I have never heard of cherry frosting before!! This would be perfect with our fresh cherries we get here. Now this makes me giddy! I love Maraschino Cherries and I love frosting too. Now that you confessed, I am not ashamed now to admit as well! lol I sure this tastes amazing can’t wait to try them. I’m not a fan of maraschino cherries like I am with sweet cherries, but that looks so delicious. Thanks for sharing! I never attempted to make frosting before but this sounds simple. I’m so trying it for my husbands birthday! Mmmm, this is genius! How come I never thought of this before! Bookmarked! I could eat that by the spoonfuls. I love Cherries. I wonder if my daughter would love to have this on her bday cake. Ahhhh yum! I love Maraschino cherries. I could eat them straight from the jar, but this sounds like a great way to utilize them and get the sweet taste all at the same time. I had no idea you could make something like this! How cool! thanks for sharing! YUM! I have to try this, I bet it would be really good. Easy to make too! Thank you Kristin. It is so easy and delish! My husband is the lover of all things cherry in this house. I am going to have to surprise him with this. His birthday is coming up in a few days. Great idea Chrystal- Let me know how he likes it. This sounds amazing! 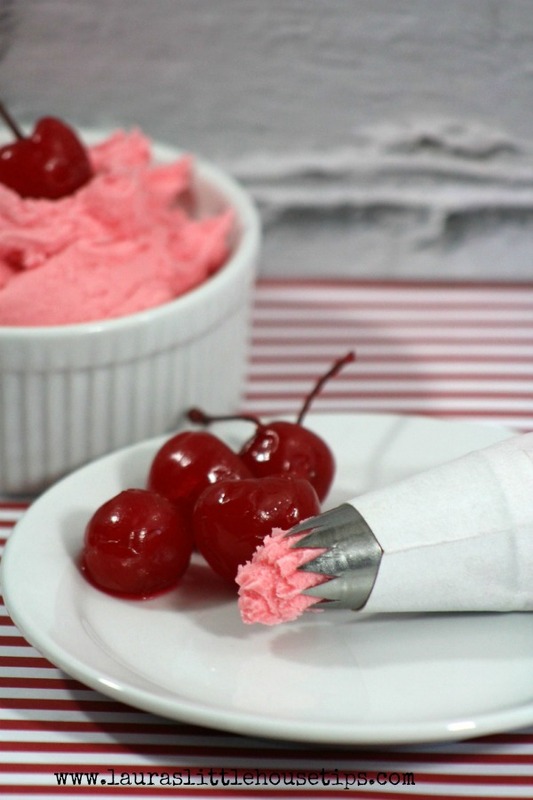 I love maraschino cherries and never thought about making frosting out of them. I love maraschino cherries. Will have to try this frosting on my next cake. I make this all the time when we make chocolate cupcakes! I’m a big fan of cherries, what with living near the cherry capital of the country. If you add meringue powder and a little less butter, you can also pipe these into shapes to get a hard frosting candy decoration. Yum! 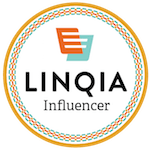 🙂 Pinning for later! Visiting from Pretty Pintastic Party. Thanks for sharing! Kim @The Baking ChocolaTess recently posted…Snickers Stairway to Heaven – 20 Reasons Not to Leave!